Ever since I learned about this Figma via Danny Choo, I determined to grab it. 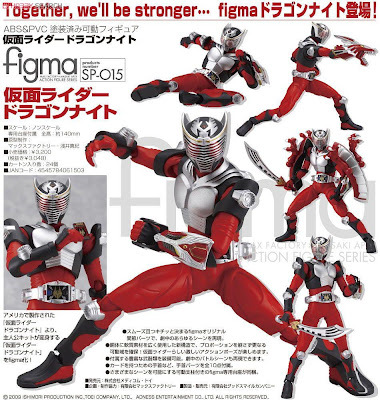 For the first time ever Max Factory produced a Figma for Kamen Rider and as icing on the cake, they gave plenty of weapons and accessories - you will get that dragon head part for the right hand, the sword and of that twin shield - remind me of that FFR02 Ryuki Dragreder. Note: Image from Hobby Search - I don't claim any rights on this photo. All rights reserved by the owner. The price is roughly around SGD 50.00 before adding what ever shipment charges. Or you can also ask the local toys & hobby retailers to get this item for you. In Brunei, we recommended that you get it from the famous local toys & hobby shop CH-Toynation.